A fabric designer and chemical engineer have teamed up to design fabric woven with solar panels for the future of wearable, autonomously powered technology. Marianne Fairbanks, an assistant professor at the University of Wisconsin-Madison (UW-Madison), and Trisha Andrew, a former assistant professor of organic chemistry at UW-Madison who is now at the University of Massachusetts-Amherst, co-designed the fabric out of a shared interest in the wide application potential for solar-charging fabric. Andrew’s expertise is in chemistry, materials science, and electrical engineering, and she has been developing low-cost, lightweight solar cells as part of her research. A recent innovation she developed is an organic, dye-based solar cell deposited onto paper. A designer and a chemist teamed up to develop fabric interwoven with solar panels that can power textiles and other wearable technology. Fairbanks has more of an art and design background. Before joining UW-Madison, she had a company called Noon Solar that sold solar-charged handbags to the high-end, urban-based fashion market in as many as 30 stores in the US and Canada. The two put their heads together to coat different weave types and structures with a polymer that increases the fabric’s conductivity tenfold, they said. Once fully coated, the fabric will serve as the bottom electrode, forming a base on which to build the rest of the solar cell by depositing two different dyes and a top electrode on the foundation, with the contact between the four deposits making up a complete and functional cell. Fairbanks’ fabric design expertise came into play with the suggestion that the team create a spool of thread for each of the four components of the cell. The idea is that if those threads could be woven together, the weave’s cross-sections would also create the contact points necessary for the device to be fully functional. Integrating solar panels and other energy-harvesters into fabric to find an alternative to batteries for electronically enabled textiles and wearable technology is not a new concept. Researchers at the Georgia Institute of Technology have developed fabric that can simultaneously harvest energy from both sunshine and motion, and the fabric also includes a small solar panel. However, Fairbanks and Andrew said their approach is different because of their collaboration, which brings together the technologies from both the design side and the engineering side in the lab using viable manufacturing processes. This overcomes the manufacturing challenges that Andrew said is slowing the rollout of inexpensive, consumer-friendly solar cells. “There’s no one out there, there’s no designer working with a device person trying to do this -- that’s us -- and that’s what really excites me about this project even today,” she said. The team has designed a prototype glove based on their research that’s made of pineapple fiber and cotton. 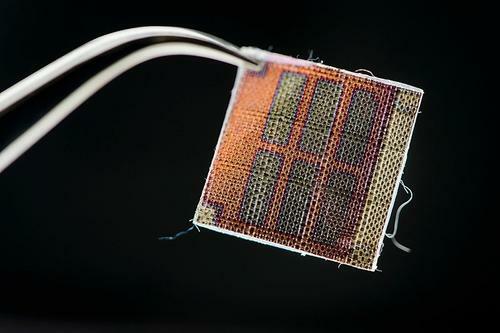 The fabrics conduct electricity to warm different parts of the glove. Fairbanks and Andrew are hoping this will be the first product of their collaboration that they take to the commercial market. Elizabeth Montalbano is a freelance writer who has written about technology and culture for more than 15 years. She has lived and worked as a professional journalist in Phoenix, San Francisco, and New York City. In her free time she enjoys surfing, traveling, music, yoga, and cooking. She currently resides in a village on the southwest coast of Portugal.